In his recent summary of his Alliance 21 paper for this blog , ADM Gary Roughead cogently explained why Australia and the United States benefit from high levels of military interoperability. He also suggested several fertile areas where further developing shared approaches would pay dividends, including the establishment of a governance mechanism to move what has been a somewhat ad hoc (but often successful) approach onto a more formal footing. I’ll resist covering the ground again here, other than to say ‘what he said’. In any case, my perspectives on some of those issues can be found in my full length paper . ADM Roughead’s paper comes with the perspective you’d expect from someone with an impressive career as an operator of military capability. My paper takes a different tack and focuses on acquisition and industry policy, mostly here in Australia but also raises some issues where the United States could helpfully review its approach. From experience, I know there’ll be some resistance to those observations. One of the objections is usually that there isn’t a level playing field in the global defence marketplace—meaning that Australian companies would be placed at an unfair advantage. My usual response  to that is that if other countries want to be inefficient in a way that lets us capitalise on their poor policy, we should let them. But I’m prepared to make an exception to that argument in the case of a close ally. After all, it’s in our interest as well as America’s for their procurement processes to be as efficient as possible. For a start, I recommended that American systems should be developed with an expectation of export to close allies. This hasn’t always been the case, but with increasing American expectations of their partners and allies doing more in the way of burden sharing—as seems to be the case in the Pacific region and was demonstrated in the Libya campaign last year where Europeans allies were concerned—it seems to be in the interest of both sides of the arrangement for allied capabilities to be at a high level. A step in that direction was the release to Australia of the EF-18G Growler airborne electronic warfare platform, which represents the first time such a capability has been exported. I also saw some scope for the US to lower some of the effective barriers to Australian companies operating in the American market. 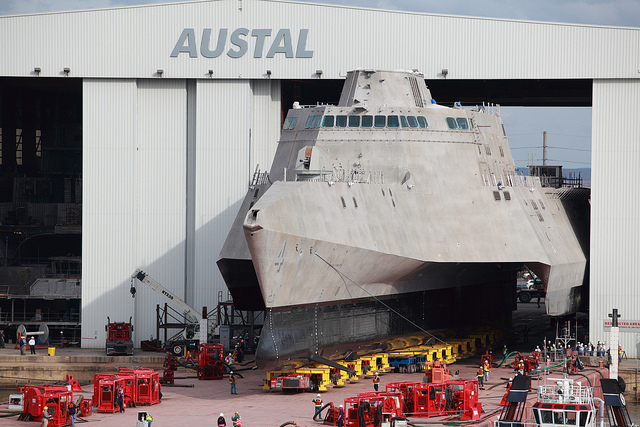 Perth shipbuilder Austal has been very successful winning work for the USN, but had to establish a new yard in Alabama to do so. Not knowing the details of the business case, it’s impossible to tell if that was the most efficient solution, but Austal already had a production facility in Perth, and an expansion on the existing base is likely to have been a cheaper all-round option—but wasn’t consistent with US procurement policy . I also see a problem with the way that work on the F-35 Joint Strike Fighter program has been allocated. In effect, the prime contractor (with the acquiescence of the US Government) has used contracts to attempt to ‘tie’ partner governments to acquisition of the F-35. Australian companies have won work on the program as a result of a limited competitive process. But the work is contingent on Australia continuing with its planned purchase of the aircraft—effectively adding a steep local political price to any decision to pursue an alternative, and recruiting the Australian industry lobby to the cause of the F-35. In effect, what could be an arms-length commercial relationship is instead being used to constrain the Australian Government’s decision making on an important defence capability. The disadvantages aren’t one-sided either. The US will have trouble signing up partners and allies for future projects after this experience. From the contractor’s side, the distorting effect of the ‘pay to play’ approach to industry has almost inevitably resulted in a less than efficient allocation of manufacturing contracts. And if partner countries with industrial work already under way defer, downsize or even abandon their F-35 acquisition, the disruption to production if work is taken away from local firms will introduce still further inefficiencies and delays into an already troubled program. Finally, interoperability isn’t just about the hardware. As well as the logistics, training and doctrine development that ADM Roughead discusses, there’s also behind the scenes support in the form of intelligence. Systems such as the Growler, F-35 and cyber warfare require extensive intelligence support to operative effectively. Not just by keeping ‘threat libraries’ up to date, but also in near-real-time exchange of data to deconflict activities and coordinate manoeuvre. The deep intelligence relationship enjoyed in the signals intelligence world provides many of these benefits already. But it’s not clear—at least from the outside—whether the intelligence sharing arrangements required across the board are as robust. intelligence cooperation is increasingly important for the effective use of cutting edge systems. The Sigint model of cooperation might need to be extended into other realms—especially cyber. Andrew Davies is a senior analyst for defence capability and executive editor of The Strategist. Image courtesy of Flickr user Official US Navy Imagery .